Our students have literally been seeing stars today as we welcomed Simon from Space Odyssey, who gave us a tour of the Cosmos. 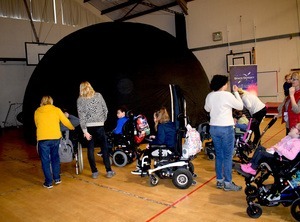 The students had an immersive 3D experience in the explorer dome which was set up in the sports hall. The dome uses spectacular 360-degree, 3D immersive imagery projected all around the inside, with Simon using an amazing range of ‘Fulldome’ video clips, animations and software to bring the Universe to life. All classes took part and thoroughly enjoyed it. Thanks to Simon and also to Teacher Sophie Vye for organising.